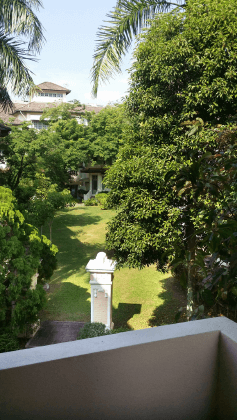 With lush green gardens alive with great old trees and chirping birds, the Cascadia apartments at Halaman Cantonment in Penang’s Pulau Tikus offers a very idyllic living environment. 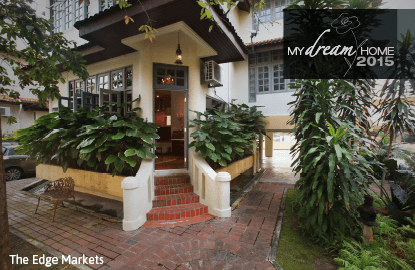 The gardens were probably the main reason behind Duncan Tan’s decision to buy an apartment here 10 years ago, as well as the fact that the location was fantastic, with eateries, markets and shopping outlets all within walking and biking distance. The 22-year-old three-storey, three-bedroom apartment that Tan acquired was a little more compact than he was comfortable with. In fact, “compact” is a rather generous description of the original layout. “It was very cramped,” says the jovial Tan with a laugh. The floor area of the first two levels measures 19ft by 18ft, including the staircase. The first floor originally contained a living/dining area and a kitchen, the second floor, two bedrooms and a bathroom, and the third floor, which has a smaller floor area, the master bedroom and a bathroom. When resort-style living is much in favour these days, this bento-box layout is enough to induce claustrophobia in even the most mentally strong. That said, Tan made do with this initial layout for a good eight years before finally deciding to renovate and refurbish. 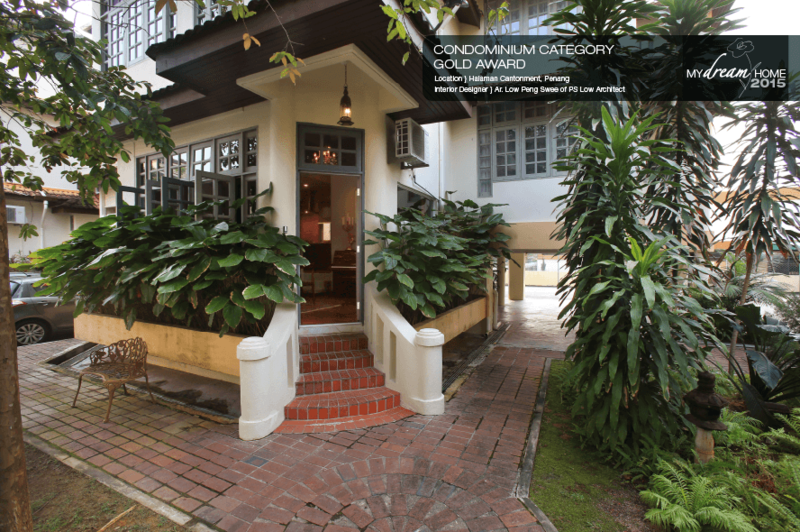 He sought the help of long-time friend and current employer Low Peng Swee, founder of PS Low Architect. And like any other project, the apartment came with challenges. 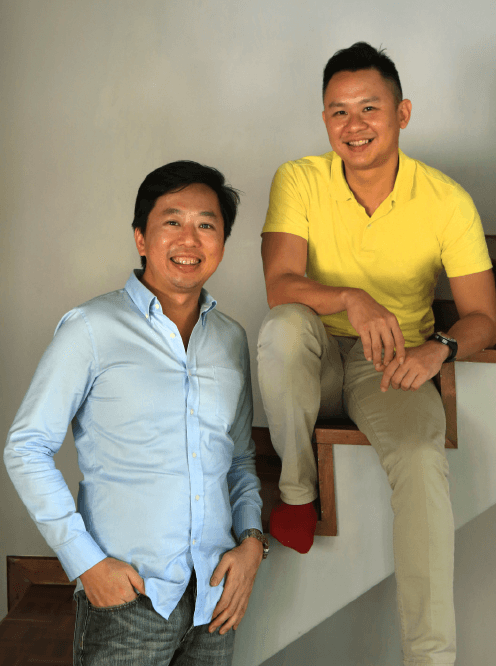 There were two — Tan’s limited budget and finding a way to fit and incorporate his eclectic collection of objets d’art and antiques. As much of his treasures are very ornate — Elizabethan and baroque —Low advised him to temper it with a contemporary styling. The collection as a whole is eclectic, undefined by a single period. Tan says he simply chose them because he thought they were beautiful. A quick glance around his home, one can observe that he has a penchant for gilded wood and candelabras. How to make it all work? Contrast: finding the right palette that bridges the delicate ornateness of his collectibles with contemporary furniture. It was a matter of ensuring that the design and feel of the home was masculine, explains Low. As he has a taste for classic décor, if he decided to go classical all the way, “it would be too ‘grandmotherly’”, Tan quips. The issue of space was dealt with first. Walls were broken down so that each floor had an open plan. Now, every corner enjoys natural light from the windows. To create fluidity from the ground up, the railings were removed from the staircases. This has not only opened up the space further but also adds to the aesthetics of the space as the stairs now appear to be floating. Their zig-zag ascend also adds visual appeal to the apartment. The original back door, which leads to the property’s centre courtyard garden, has been converted into the front door. The stoop has been spruced up with a rich-grey door, which contrasts with the red-brick steps. Large palms in box planters add to the welcoming charm of this newly christened front door. Step inside, and you’re greeted with an elegant dining room, warm with wood flooring and furniture, embellished further with tapestry and paintings in gilded wood frames. A large vanity mirror hangs on the feature wall at one end of the room while a sleek rectangular dining table with a marble top sits at the heart, complete with two classic chandeliers overhead. In the far corner is the humble kitchen, kitted out in grey and stone. The walls are in a light grey to tie everything together. Little could be done to the windows — the usual constraints of apartment living — but Low managed to convert one panel into a picture window, replacing the multiple small frames with a single piece of glass. It was one way of letting the outdoors in. The neutral colour palette runs through to the upper floors. On the second floor, the living room has a more modern tone. The split levels allow the owner to play around with different styles. Picked as a space for total relaxation, Low advised Tan to keep it uncluttered and minimalist. 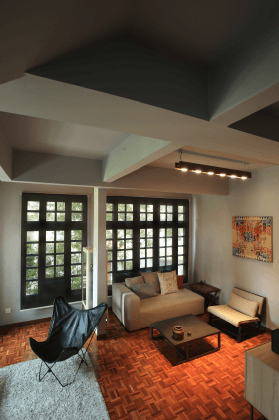 Apart from tearing down the walls that formed the two bedrooms, Low also stripped the plaster ceiling, exposing the structural beams and red bricks. The owner and designer agreed that it added character and a unique aesthetic to the space that was quite harmonious with the contemporary lines in the furniture Tan was using here. The area enjoys a lot of natural light from the underdressed windows, which also offer views of the garden. The original parquet flooring was maintained and given a bit of a polish. Stone and white upholstery and soft furnishings take precedence — plush in texture, they make the ambience inviting. The walls are bare at the moment save for one art piece and two portraits of Tan finishing a bicycle race. 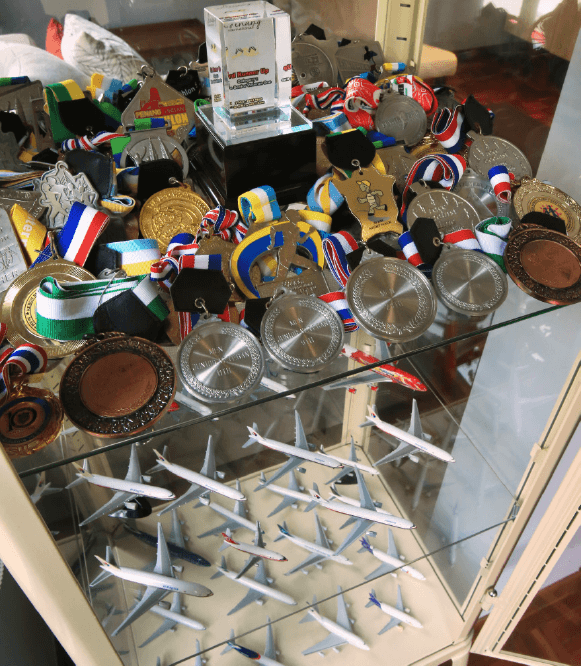 One of Tan’s favourite features here is a display case containing medals he has acquired from his biking and running competitions, as well as an extensive collection of model airplanes he has amassed since childhood. “I love commercial airplanes and I actually have more but I don’t have the space to display them all. I actually also have airport models that I would love to set up and display,” Tan confesses a little sheepishly. On the top floor, the master bedroom is Tan’s little fortress of solitude. Here, Low designed a generous bathroom encased in glass and an open wardrobe concept to continue the theme of open spaces. What has Tan taken away from designing his first home? “There was a lot of brainstorming and fighting … to build your dream house, it takes a lot of time, but it’s worth it,” says the proud homeowner.